Here we are again, people. It’s that time when I let you know what’s going on in genre magazines that might possibly appeal to fans of heroic fantasy. Whatever lack of love swords & sorcery gets from the big publishers, it’s doing quite well at the short story length in the ‘zines. Swords and Sorcery Magazine Issue 37 kicks off its fourth year of publication with two decent enough stories. The first is “Old Bear and the Grey Bird” by Nathan Elwood. It’s narrated by Old Bear, a non-human native of a land increasingly dominated by human colonists. He’s almost nine feet tall, covered in thick gray fur, and two short horns rise out of his head. His people have retreated into the remote, hidden places of the land and most humans consider them legendary. Despite his own efforts to escape interaction with humans, Old Bear feels moved to intervene when he comes across a burned and pillaged human settlement. When he spots several raiders about to kill the only survivor, a young girl, the hunter steps in to rescue her. The rest of the story is about him deciding what he should do with her. With his horns and fur coat and the presence of a young girl, there was a not unpleasant Monsters, Inc. vibe to this story (though with more violence). Actually, it was more like a Sasquatch telling his own story for a change, instead of just being photographed on the run. I liked Old Bear’s voice and I especially liked that the story stands on its own and doesn’t read like it’s been stripped from a longer text. “Stout” by Jay Recquard is a return to some of the characters I first encountered in his story “Narrows” from S&SM #28 (reviewed favorably by me here at Black Gate). It continues the adventures of a battle company called the Grinders. Last time they were hunting for a bandit leader and his gang. This time they are transporting a group of passengers. Among those passengers is a beer-brewing dowser. When he and his companions convince the Grinders to stop so they can find and collect some special water, while it does eventually lead to some very good beer, it also leads to serious trouble. There’s a nice action set-piece in “Stout”, but what made it fun was the humor. There’s a nice, casual banter between the Grinders and the dowser, Stout, that I really enjoyed. Not a groundbreaking story, but a fun one I readily recommend. Besides, who doesn’t want to read a good beer story? Regular readers of these roundups (What, you’re not? Well you need to be! ), know that I have a love-hate relationship with Beneath Ceaseless Skies. It really has nothing to do with the magazine, which is quite good, but my own tastes. I want every issue to be filled with heroic fantasy. Instead it publishes whatever it wants, including plain old award-winning non-heroic fantasy stories. Well, both of BCS’s February issues have two (that’s two!) more-or-less heroic fantasy stories. As eager as I am for new S&S it made for a pretty happy fan last month. And two of them were very good. Exciting times, folks! BCS Issue #166 kicks off with “The Wizard’s House” by Stephen Case. It’s a prequel to his excellent “The Unborn God” (reviewed here). I wrote that the earlier story made me sit up and exclaim out loud. This one didn’t quite do that because the originality factor was a little diminished here, but it’s still very good. In the earlier story the protagonist’s memories kept shifting as the new god’s influence on reality grew, constantly changing and remolding the past. In this story we supposedly learn the truth of the protagonist’s past, though it’s clear that may not actually be possible under the influence of the Unborn God. It’s a terrific and unnerving idea. My father paused for a moment in unloading the bulging baskets. There was a pained look in his eyes, and I realized that without thinking I had gone too far. The second story in #166 is “The King in the Cathedral” by Rich Larson. Fawkes, the half-brother of a deposed king, sits exiled and imprisoned in an abandoned cathedral far out in the desert, playing games with his warden, a metal automaton he calls Otto. Each day is the same: the pair play games, supplies arrive by teleportation. Things change when a young woman appears, hoping to free Fawkes and get him to take on his brother’s usurper, a wizard called the Illusionist. Fawkes will have none of it. Despite not having a single bit of action, this is one of the month’s good ones. I appreciate his desire to avoid being a hypocrite regarding both how good a ruler his brother really was and how bad the Illusionist actually is. BCS #167 opens with a story that I want to like more than I can. It’s called “Madonna” and it’s by Bruce McCallister. 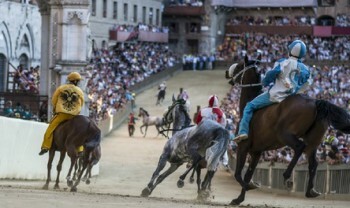 It’s set in the Middle Ages in the Italian city of Siena during the Palio, the great twice-annual horse race. It involves a child pope, Bonifacio, his aide, another boy, and a case of secret identity. I enjoyed parts of it very much. Unfortunately, it’s the second of two sequels to a story called “Blue Fire” about vampires taking over Rome and the Vatican. I only know that because of something I read in another review of the story. I’m tantalized by the references to vampires (Drinkers of Blood) and their hunt for the Boy Pope. But I don’t have the five-year-old copy of Fantasy & Science Fiction where “Blue Fire” was published, which means I feel more than a little at sea reading “Madonna.” And so, I suspect, will you. The second story in #167, and our final one for this installment of the roundup, is “Y Brenin” by C. A. Hawksmoor. It’s set in a faux-Welsh world where the Red King of the South has been warring with his brother from the North. The war comes to a halt when the Northern king’s knight and lover, Mercher, captures the Red King. Over the course of their trek to the North where the prisoner will be turned over to his brother, the two travellers debate and struggle over the nature of the war and the state of the country’s affairs (i.e. famine, plague). There’s a strong feeling for the well-described landscape as the Red King and Mercher cross the mountain Y Brenin, but I found myself unable to quite believe the words and actions of the characters. So that’s your roundup. There’s still an issue of Fantasy Scroll floating around that I need to dig into, and by next month maybe another issue of Heroic Fantasy Quarterly. So, keep reading the magazines and letting them know what you think. I’m sure the editors and authors will be glad to hear from you. I liked those BSC stories. I didn’t realize “The Wizard’s House” was a prequel. The cult of the Unborn God is spectacularly creepy. I’ll have to go check out the other story. “The King in the Cathedral” has some lovely twists in it, and the ending seems to promise the kind of heroic fantasy BG readers favor will be in the offing for the characters, if not for us. Looking forward to your take on Fantasy Scroll. This might be the first comment I’ve gotten by someone who has read the stories already. Thanx! “The Unborn God” is terrific. I’ve read several of his other stories and they’re pretty sharp as well.